Put cream cheese in a medium bowl. Add walnuts, raisins, syrup and cinnamon. Stir with a wooden spoon or rubber spatula until ingredients are mixed together. 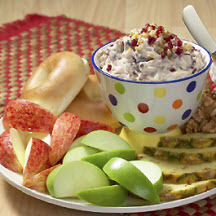 Spread on bagels, toast, or apple slices. Tip: To make as a softer dip for apple or pineapple slices or strawberries, use twice as much maple syrup. Nutritional Information Per Serving (1/12 of recipe): Calories: 121; Calories From Fat: 72; Total Fat: 8g; Saturated Fat: 3g; Cholesterol: 11mg; Total Carbs: 11g; Fiber: 1g; Protein: 3g; Sodium: 57mg.